Contacts are not currently imported through the integration, but a set of logic determines what client a work item is associated with. Your Karbon contacts are not currently imported into Practice Ignition as part of the integration between the two apps. 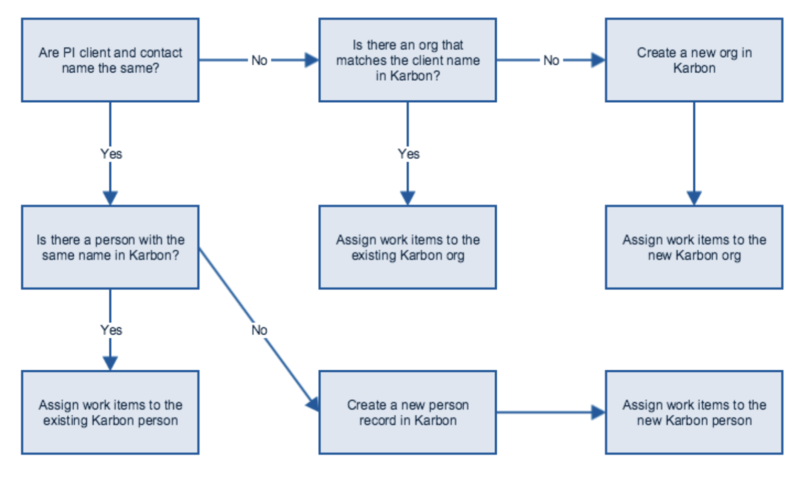 Currently, the following logic is used when choosing what contact in Karbon to associate with the work item that has been created through Practice Ignition. In the 1st box, Practice Ignition (PI) is asking if the client and contact name are the same. An example would be if John Smith is both a tax client and a contact. If yes, then PI will do a lookup to see if the name matches exactly in Karbon. If the contact exists, PI will then create work against that contact John Smith. If there is not an exact match, PI will create a contact by the name John Smith in Karbon. An example would be if John Smith is the contact but Acme Corporation is the client. In this case, the answer is No and PI will do a lookup to see if the Organization name Acme Corporation matches exactly in Karbon. If there is an exact match, PI will create work for Acme Corporation. If there is not an exact match, they will create an Organization contact Acme Corporation.